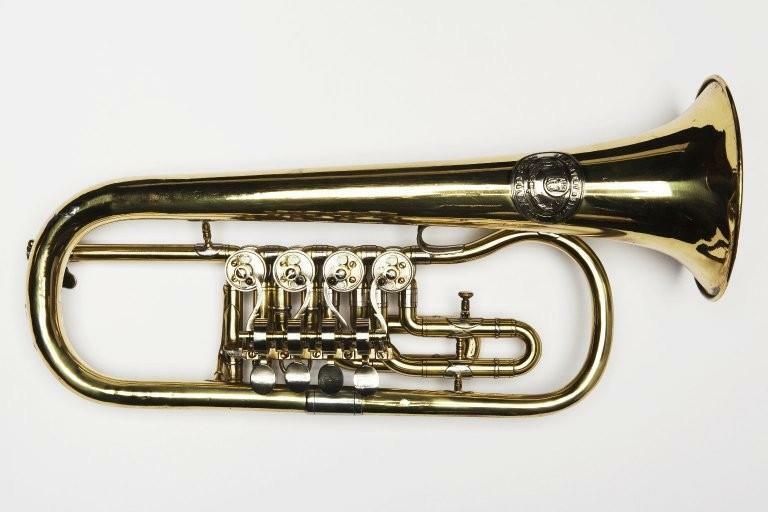 Flugelhorn. Nominal pitch: 4½-ft B?. Technical description: Brass with german silver trim. Valves give lowering of 2, 1, 3, 3 semitones respectively. Fitting for music card holder. Valve type: 4 rotary valves; rubber (?) buffers on top caps. Inscribed on embossed circular german silver plaque on bell "V.F. CERVENY*/ & SYNOVÉ / HRADEC KRÁLOVÉ CSR. "; in centre of plaque a shield incorporating "C" with a tuba as a monogram, surmounted by a crown, with a laurel wreath below; stamped at edge of bell "377", with a triangular symbol beneath.